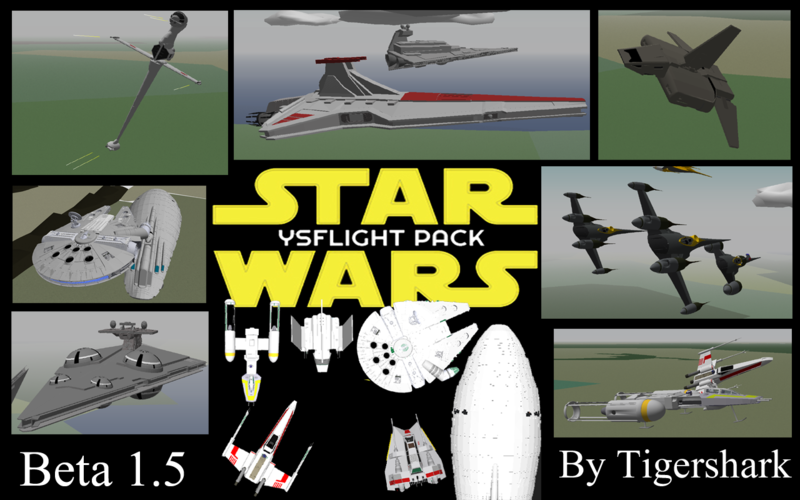 Here it is the beta pack 1.5 ysflight star wars pack. i was thinking to a add lot more star wars stuff because i want new and different type vehicles model. I did model like millennium falcon , b wing, shuttles, naboo n1 starfighters, more star destroys and gr-75. plus i did remade of all model from buta pack. but i am going warn you in this beta pack so there is going be a some mess in the pack there for i will still going fix them so do not worry. Last edited by tigershark on Tue Dec 11, 2018 8:12 pm, edited 1 time in total. I am unable to download from MediaFire because they blocked downloads to people using an ad blocker. I refuse to turn off my ad blocker on principle. I would have suggested using YSUpload, but clearly I've been away for a while as that's now gone. I will try to find out what happened to ysupload.com, ask if there is a new version, or if I can continue my earlier project to host pack releases on my own server.